Designed for Off-line Verification of 1D and 2D Barcodes to ISO/IEC Standards - Microscan LVS-9570 is a 1D and 2D handheld barcode verifier designed for off-line verification of barcodes to ISO/IEC standards. The LVS-9570 is unique in the world of ISO verification due to its ease of use and ability to verify linear (1D) and two-dimensional (2D) barcodes using a lightweight, handheld verifier; auto-discriminate the symbology, narrow bar width and aperature to be used to evaluate the code; and highlight trouble spots in the code. • The LVS-9570 was formerly known as the Integra 9570 by Label Vision Systems. • Inspection. Inspects all nine of the ISO (ANSI) parameters, plus added features of determining blemishes, opacity, and human readable validation. The LVS-9570 also verifies 2D barcodes and reports all parameters as specified in the applicable symbology specification. • Detailed Analysis. Analysis is colour coded to show exactly where the problem is located within the barcode, and sections of the barcode can be analyzed to determine how to solve the problem. Reference to an online help screen aids in the analysis. • Numerous Verification Options. Multiple codes, including any combination of Linear, 2D (such as Data Matrix, QR Code and Aztec Code) and Stacked Linear (such as PDF 417, Micro PDF and Composite Codes) can be verified on one label within the field of view. • ISO Grading. ISO grades barcodes on various label sizes. • Accurate. The LVS-9570 is the most accurate handheld verifier on the market today with the highest degree of accuracy and repeatability. • Reliable. The LVS-9570 is the most reliable handheld verifier on the market. • EAN/UPC NIST Traceable Calibrated Conformance Standard Test Card. The LVS-9570 is supplied with a NIST traceable calibrated conformance standard test card provided by GS1 to ensure that the system is always within a known calibration standard. MicroScan LVS INTEGRA 9570 Handheld 1D ONLY Barcode Verification System - LVS9570 high-performance, lightweight handheld barcode verifier that validates the print quality of 1D barcode symbologies to ISO/IEC, ANSI, GS1, and UDI standards. 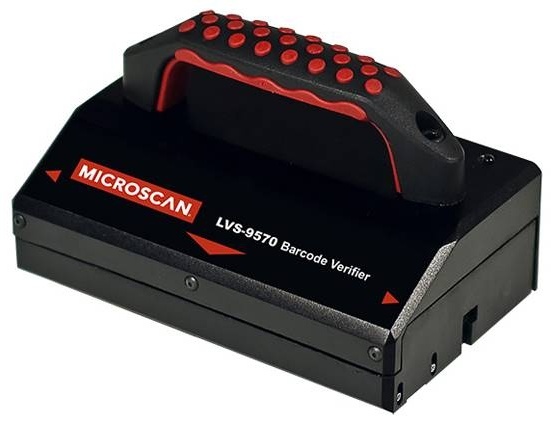 MicroScan LVS INTEGRA 9570 Handheld 2D ONLY Barcode Verification System - LVS9570 high-performance, lightweight handheld barcode verifier that validates the print quality of 2D barcode symbologies to ISO/IEC, ANSI, GS1, and UDI standards. MicroScan LVS INTEGRA 9570 Handheld 1D and 2D Barcode Verification System - LVS9570 high-performance, lightweight handheld barcode verifier that validates the print quality of 1D and 2D barcode symbologies to ISO/IEC, ANSI, GS1, and UDI standards.